When Motorola’s vice president, Martin Cooper, made his first call from a mobile phone device, which priced about four thousand dollars back in 1983, one could not have imagined then that in just a few decades mobile phones would become a crucial and ubiquitous part of everyday life. Not surprisingly this technology is also being increasingly misused by the criminal fraternity to coordinate their activities, which range from threatening calls, to ransoms and even bank frauds and robberies. Recordings of mobile phone conversations can sometimes be presented as major pieces of evidence in a court of law. However, identifying a criminal by their voice is not a straight forward task and poses many challenges. Unlike DNA and finger prints, an individual’s voice is far from constant and exhibits changes as a result of a wide range of factors. For example, the health condition of a person can substantially change his/her voice, and as a result the same words spoken on one occasion would sound different on another. The process of comparing voice samples and then presenting the outcome to a court of law is technically known as forensic voice comparison. This process begins by extracting a set of features from the available speech recordings of an offender, whose identity obviously is unknown, in order to capture information that is unique to their voice. These features are then compared using various procedures with those of the suspect charged with the offence. One approach that is becoming widely accepted nowadays amongst forensic scientists for undertaking forensic voice comparison is known as the likelihood ratio framework. The likelihood ratio addresses two different hypotheses and estimates their associated probabilities. First is the prosecution hypothesis which states that suspect and offender voice samples have the same origin (i.e., suspect committed the crime). Second is the defense hypothesis that states that the compared voice samples were spoken by different people who just happen to sound similar. 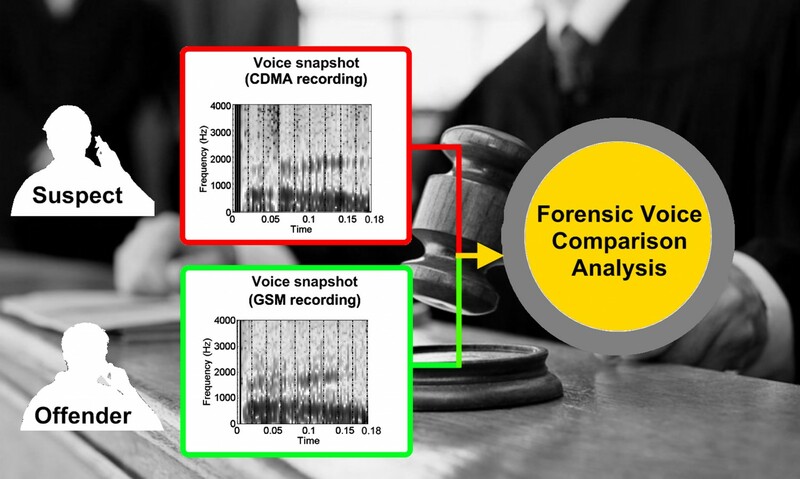 When undertaking this task of comparing voice samples, forensic practitioners might erroneously assume that mobile phone recordings can all be treated in the same way, irrespective of which mobile phone network they originated from. But this is not the case. There are two major mobile phone technologies currently in use today: the Global System for Mobile Communications (GSM) and Code Division Multiple Access (CDMA), and these two technologies are fundamentally different in the way they process speech. One difference, for example, is that the CDMA network incorporates a procedure for reducing the effect of background noise picked up by the sending-end mobile microphone, whereas the GSM network does not. Therefore, the impact of these networks on voice samples is going to be different, which in turn will impact the accuracy of any forensic analysis undertaken. Having two mobile phone recordings, one for the suspect and another for the offender that originate from different networks represent a typical scenario in forensic case work. This situation is normally referred to as a mismatched condition (see Figure 1). Researchers at the University of Auckland, New Zealand, have conducted a number of experiments to investigate in what ways and to what extent such mismatch conditions can impact the accuracy and precision of a forensic voice comparison. This study used speech samples from 130 speakers, where the voice of each speaker had been recorded on three occasions, separated by one month intervals. This was important in order to account for the variability in a person’s voice which naturally occurs from one occasion to another. In these experiments the suspect and offender speech samples were processed using the same speech codecs as used in the GSM and CDMA networks. Mobile phone networks use these codecs to compress speech in order to minimize the amount of data required for each call. Not only this, the speech codec dynamically interacts with the network and changes its operation in response to changes occurring in the network. The codecs in these experiments were set to operate in a manner similar to what happens in a real, dynamically changing, mobile phone network. The results suggest that the degradation in the accuracy of a forensic analysis under mismatch conditions can be very significant (as high as 150%). Surprisingly, though, these results also suggest that the precision of a forensic analysis might actually improve. Nonetheless, precise but inaccurate results are clearly undesirable. The researchers have proposed a strategy for lessening the impact of mismatch by passing the suspect’s speech samples through the same speech codec as the offender’s (i.e., either GSM or CDMA) prior to forensic analysis. This strategy has been shown to improve the accuracy of a forensic analysis by about 70%, but performance is still not as good as analysis under matched conditions.